The early 1970s was a heady time for Latino rock. Santana had already blazed the trail, establishing the rhythm-rooted context for Carlos' incisive guitar work on their first album, then adding Spanish-language vocals to the mix on Abraxas,notably with the chart-topping "Oye Como Va." In Southern California, the freshly renamed El Chicano (formerly the VIPs) rode the midtempo instrumental groove of "Viva Tirado, Part 1" to a huge regional hit that cracked the Top 30 nationally, while War, and a bit later, Los Lobos quietly found their own transcultural sounds. Around the Bay, Tower of Power set the standard for horn-driven funk while Pete and Coke Escovedo formed Azteca, marshalling as many as 17 band members into a thick aural stew of percussion, horns, keyboards vocals that featured a teenaged Neal Schon on guitar. Soon, Malo joined the party. Led by vocalist Arcelio Garcia and featuring Jorge Santana (Carlos' younger brother) on guitar, Malo evolved from the Malibu's, a popular regional show band in the mid-1960s, keeping the full horn section while adding timbales and congas. "Malo was the first band to incorporate the horns and the cha-cha together," Garcia told the Coast Weekly last month. "Carlos [Santana] was Latin rock, and we were a Latin rock orchestra." With its irresistible mix of polyrhythmic percussion, crisp horns, layered vocals and rich harmonies, the hit "Suavecito" burst from the band's debut album and shimmied into the Top 20 in the spring of 1972. That was their crossover peak—strictly speaking, you could include Malo in the roster of illustrious one-hit wonders—but the band continued touring and recording even after Garcia became ill in 1974 and had to leave the band for a while. (Little Willie G from Thee Midnighters stepped for the album Ascencion and subsequent tour. )His health restored, Garcia revived Malo in 1981. The revamped band has toured and recorded regularly, most recently releasing a pair of live sessions in 2005 and 2006. The modern Malo also often features Jorge Santana, who resumed playing with the band several years back. He'll be part of the current 12-man lineup when Malo hits the Mystic Theatre on Jan. 25. 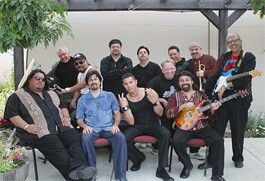 As Malo celebrate their 35-year history, Garcia sees the band's widespread influence in the current crop of Latino rockers, especially Ozomatli. "All of those groups were raised on me. Ozomatli is good; I listen to them and it's like a copy of me." But he's not worried that the younger generation will supplant the originators: "There's a difference between the creator and the imitator." Malo perform on Friday, Jan. 25, at the Mystic. The Sisters Morales open. 23 Petaluma Blvd. N., Petaluma. 8pm. $22. 707.765.2121.